Rules: When Ancient Core Hound enters play, roll a die. ; 1-2: Exhaust all opposing allies. 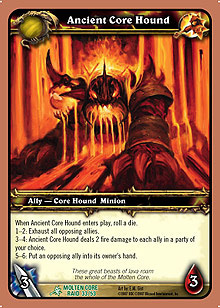 ; 3-4: Ancient Core Hound deals 2 fire damage to each ally in a party of your choice. ; 5-6: Put an opposing ally into ist owner's hand.